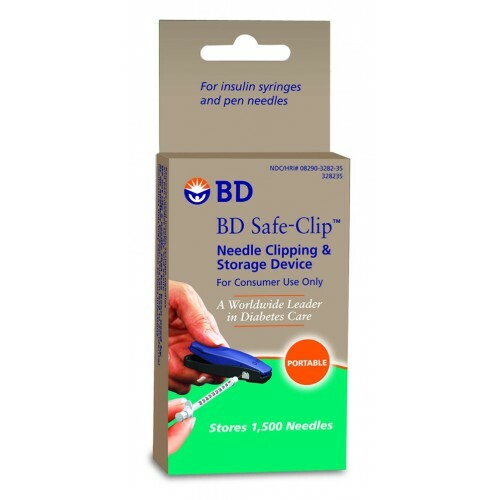 The BD Safe-Clip Needle Clipper makes it possible to safely and easily remove insulin syringe needles and pen needles -- everywhere you go. Because it locks for storage and travel, it also serves as a portable sharps container. This Needle Clipper can hold up to 1,500 clipped needles. That's approximately a 2 year supply of needles before it has to be emptied. The BD Needle Clipper can cut 28 gauge through 31 gauge needles between 3/16" and 1/2" in length. These dimensions include the vast majority of insulin needles. It is not intended for use with lancets. There's simply not a safer or more effective way to remove and store insulin needles after they are used. The small size of this device makes it a great addition to any diabetes supply kit or carry case. After clipping the needle is it safe/legal to throw the rest of the syringe body in the trash? We cannot make any recommendations regarding safe/legal ways to properly dispose of needles. It's best to seek advice from a medical facility or medical professional for information. You can also visit fda.gov for details. Excellent product. Easy to use for all persons. Highly recommended. This is the most handy tool for clipping needles from syringes or pen needles. Highly recommended! Best product available for use with disposable needles used with insulin pens. The needle clip is perfect. I could not find it in the drug stores again. Thank you so much. This should do it for 2 years. We've had to use sharps containers for years until we found this clipper. We no longer have to dispose of those bulky containers. We're going in to year two of using the clipper and it's going strong.